Superman, Sponge Bob, Astro Boy and Indiana Jones all made an apperance today at today’s No Pants Ride 2011. 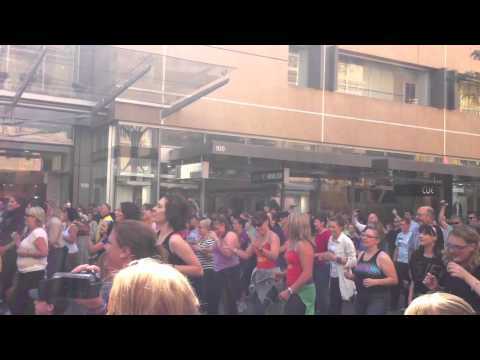 The Adelaide Flashmob were part of the first group of cities to take part in the global No Pants Subway Ride event run by Improv Everywhere. This annual event sees thousands of people worldwide on different forms of public transport taking of their pants and feeling the breeze! Thankfully, here in Adelaide the sun was out – a perfect day for a tram ride without pants. At 12pm, the flashmobbers met up at Hindmarsh Square to run through the how things were going to work and to split into teams. After waiting for a few of the latecomers, we made our way to the Pirie STreet tram station for the first tram. Each of the teams were assigned a tram stop where they would get off, take their pants of and wait for the next tram. Communuters on the second tram watched on as more and more people entered the tram doors, without pants on. We had some great reactions from some of the people onboard, and even the tram conductor had a bit of a laugh. We finished our journey at a very busy Glenelg. There were people everywhere, and it didn’t take long for people sitting near the tram stop to notice that pantsless people were getting off the tram. After a couple of group photos and some conveniently free iceblocks, we all made our own ways back home – or to the pub for a bit of a laugh and to compare stories of the day’s events. Thanks to everyone who came along – for those who participated, took photos, acted as support crew, or just wanted to have a laugh. Another great flashmob experience! Keep an eye out online for all of the other cities’ events. « Farewell 2010, thanks for the good times.